I wake and look at the clock. 3.15am. Oh dear. A restless couple of hours follow, but I eventually drop off again before we all wake at 7.00am. Showered and ready to go we leave the room at 9.00am. We are going horse riding at Grant Grove. The scenic drive up the mountains to Grant Grove takes approx 1 hour and is mistier than yesterday. We have to eat breakfast first so we drop in to Grant grove Village where we get the buffet. Its $8,95 for adults and $6.95 for children. The choice is limited by American standards, fruit, pancakes, bacon, hash browns, scrambled eggs and pastries. All very good. Its a very good way to start the day along with plenty of hot coffee. 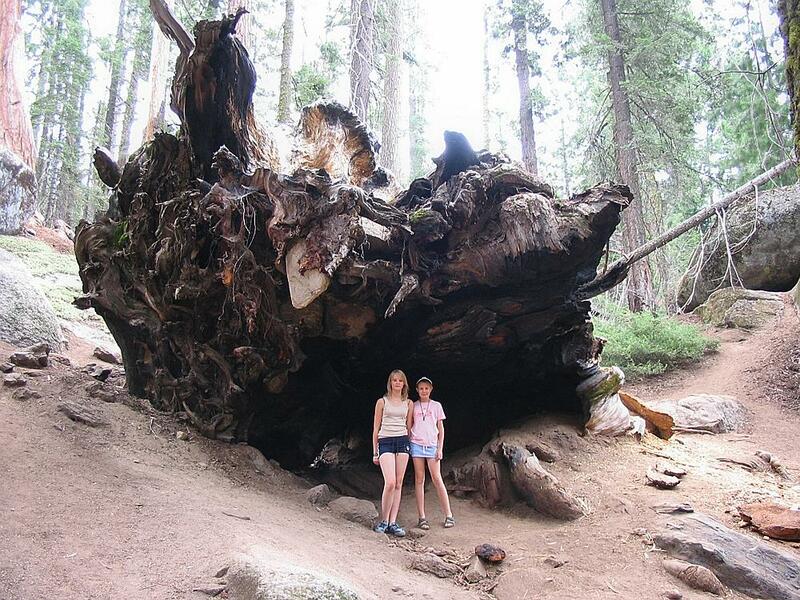 Next is a visit to the General Grant Tree, which is the 3rd largest tree in the world. It may seem like we are seeing a lot of trees and you may be thinking seen one tree, seen them all, but they are all in different settings and you would be very hard pushed not to be amazed by these monsters. By the way, why are they all named after Generals? Whats wrong with the rest of the military ranks? How about the Sergeant Wilson Tree? Or the Private Pike Bush? And this is just one of the smaller trees. 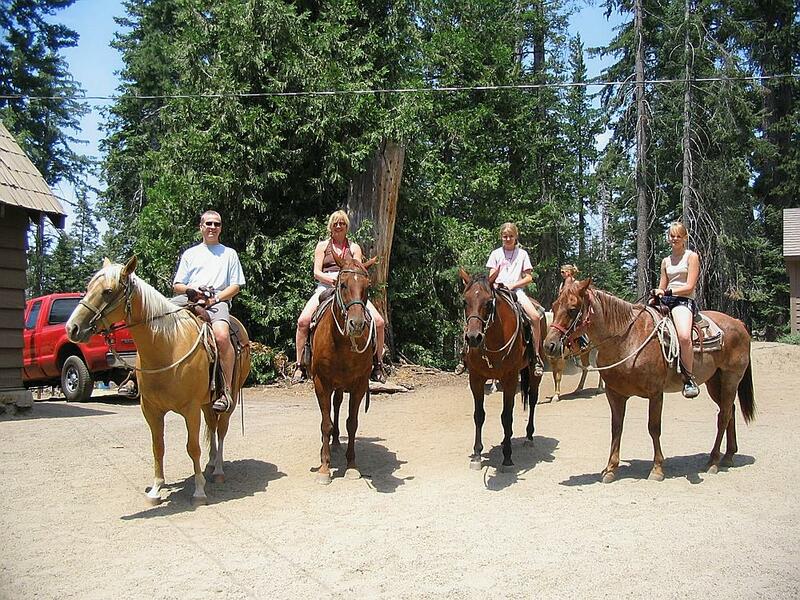 At 11,30am we arrive at the Grant grove Pack Station for our $30 per person 1-hour ride. None of us has ever ridden before so this could be interesting. As it turns out you dont really have to do anything except sit there and let the horse do the rest. They say that your horse reflects your personality and I think this may be true. I ride Tigger  a handsome devil. Tam has Try  a beauty to be sure, but a little slow. Indias is Baker  takes regular bathroom stops. Georgia rides Computer  Frisky yet sullen. Round 'em up, head 'em out, Rawhide! We get our monies worth as the ride is closer to 75 minutes than 1 hour and winds through the trees barely seeing another person. When we get off Tam declares it to be amazing. That seems to be her word for the holiday. I cant say I disagree; everything so far has been amazing. well, never you mind since when. The thing that hurts most is my knees. As I climb off the horse they nearly give way. I have developed a newly found respect for John Wayne. 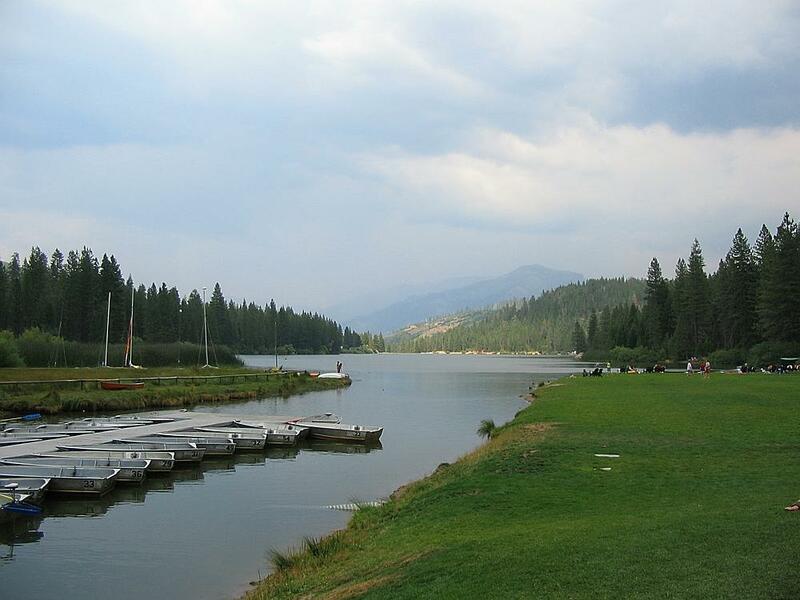 Next we drive the 7 or so miles to Hume Lake and continue on past to Sandy Cove. You may be surprised to hear that we find a sandy area in a cove. Feeding the lake is a stream, which tumbles over rocks leaving all sorts of interesting little pools to play in. 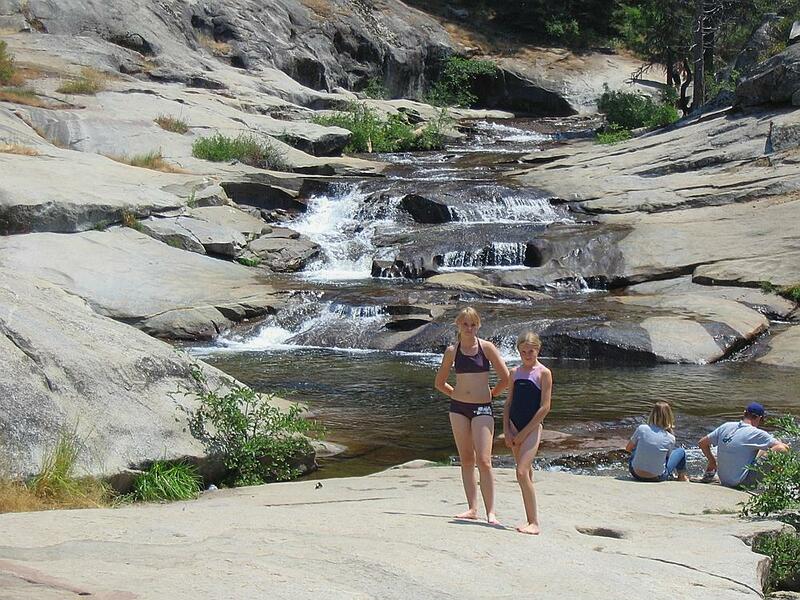 We spend a fun couple of hours watching the girls slipping and sliding. 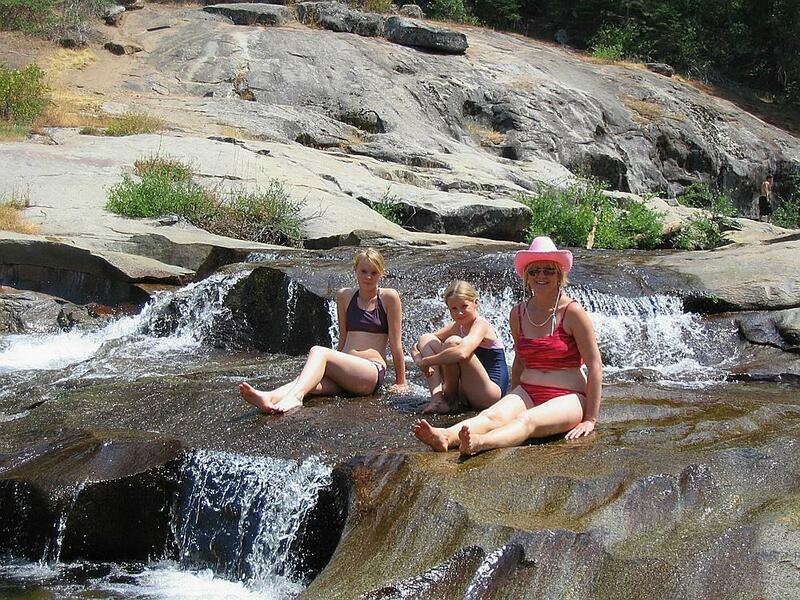 Actually I spend the time watching; Tam splashes with the girls and slides down smooth rocks into freezing pools. The womans mad. She's the first world champion cowboy rock slider. It starts to get cloudy and there are some rumbles of thunder although it never does rain. We pack up and head back to Hume Lake. 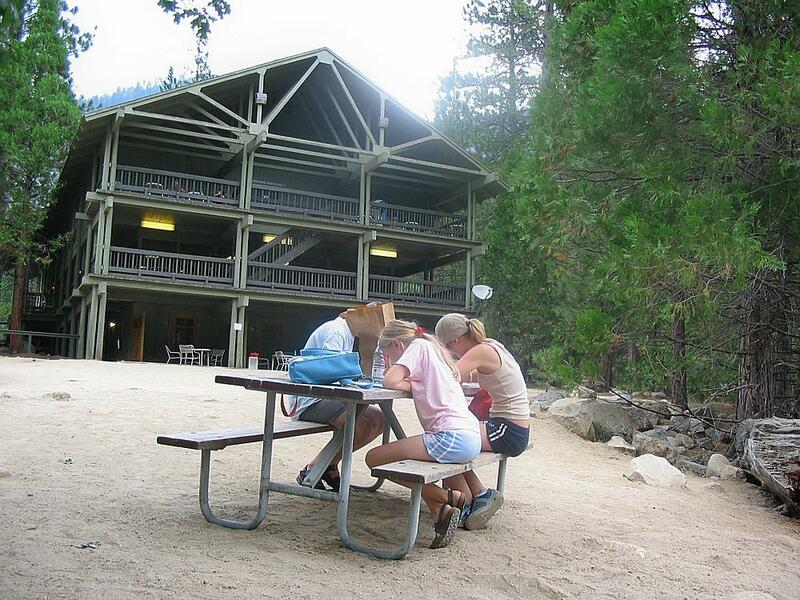 This is a Christian camp with lots of wood cabins set back in the woods surrounding the lake. Its very pretty and there is a gift shop, store and snack shop. You can also hire bikes and boats from here. The rowing boats are a bargain at $5 per hour. Only lack of time prevents us hiring one and me attempting my Steve Redgrave impersonation. A drink (no beer! Whats the matter with these Christians?) and ice cream are despatched while staring across the lake. Im a little disappointed that there arent a lot of people singing Jesus wants me for a sunbeam and exalting me to give up the demon drink. All we meet are happy and polite people enjoying themselves in a very beautiful place. Perhaps there is some reward for a virtuous life after all. The drive back down into Kings Canyon is as stunning as ever and we stop a few times to take photos and video. At one stop we hear the sound of a helicopter and as it flies overhead we see it has a water bucket attached. They are obviously still fighting the fire. A notice in Grant Grove had told us that it has so far consumed 21,000 acres! I think this gives some idea of the vast nature of these National Parks. We also learned that fire is no bad thing for the forest. In the early days of the National Parks they tried to put out the fires as soon as they started, but found that the trees didnt grow so well. They now have controlled fires to clear out some of the canopy to allow more light in and to make the ground more fertile. 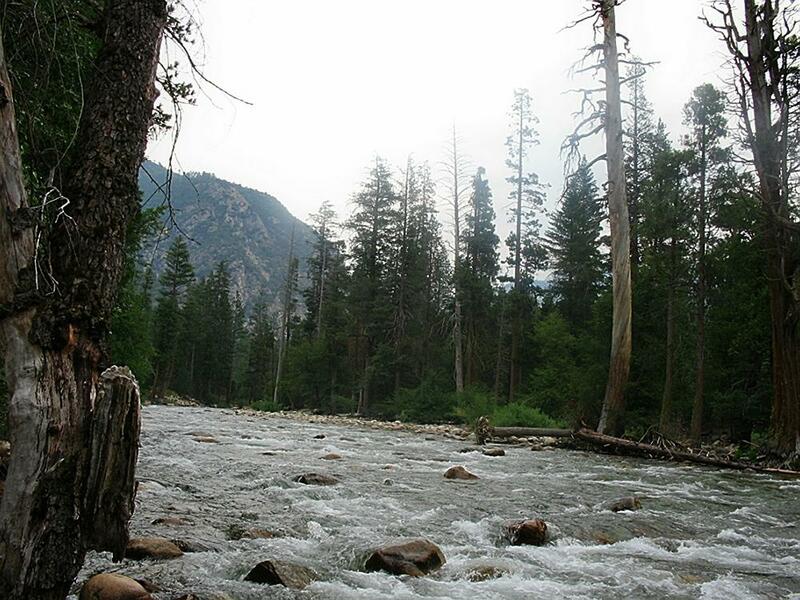 Back at Cedar grove lodge we grab a 6 pack of beer and sit at a picnic table by the side of the fast flowing river. You wouldnt exactly say it was raging, but it aint hanging around either. Who put that paper bag there? Whaddya mean it's an improvement! The river is just yards from our table. Everyone is desperate to see a bear. I offer to act grizzly for them, but Im told that would be no different to normal. And before you all laugh at my lack of knowledge, I know that the bears in this neck of the woods are Black bears, not Grizzlys. There follows a discussion on which of us would be what sort of bear. I say Georgia would be a Grizzly, which engenders a sad look on the childs face. So we say she is a cub instead. India is a Pooh bear, dont even think of asking why. Tam takes matters into her own hands and declares she would be a Honey Bear as she is such a honey. India says I should be a Polar Bear because Im so cool. She has now moved up to number one child. Back to the room to shower before heading to the restaurant, although thats probably overstating the standing of this food emporium, to eat. To be fair, I probably maligned this place yesterday. It isnt really meant to be much more than a fast food establishment and it achieves that pretty well. Between the 4 of us we have chicken strips, hamburger, chicken burger and fish and chips. With drinks this comes to $48. After the meal there isnt really an awful lot to do, so we go back to the room at 8.45pm where I write up my trip report while the ladies play cards. Not exactly a rip-roaring end to the day, but when youve had such a good time it would be a little churlish to complain. Tomorrow we head off to Yosemite.